38 DESIGN007 MAGAZINE I OCTOBER 2018 try continue to claim that a fabrication draw- ing printed on A3 paper is vital to understand customers' requirements. Corporate require- ments—even the measurable parts—are given in an analog way into an increasingly digital environment. In almost every issue of I-Con- nect007's magazines and other publications, we read about how Industry 4.0 and smart manu- facturing are growing and changing the produc- tion environment. However, the missing link is how we transfer and communicate fabrication data between the product owner and the PCB factory. To avoid ambiguous specifications, we need a common language to communicate the specification and use the same terms in all parts of the transmis- sion chain. 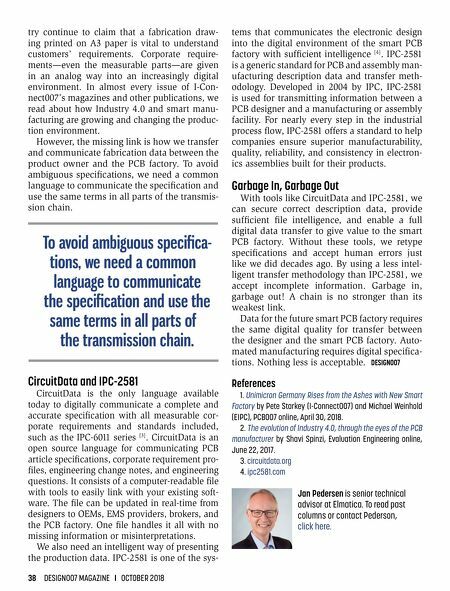 CircuitData and IPC-2581 CircuitData is the only language available today to digitally communicate a complete and accurate specification with all measurable cor- porate requirements and standards included, such as the IPC-6011 series  . CircuitData is an open source language for communicating PCB article specifications, corporate requirement pro- files, engineering change notes, and engineering questions. It consists of a computer-readable file with tools to easily link with your existing soft- ware. The file can be updated in real-time from designers to OEMs, EMS providers, brokers, and the PCB factory. One file handles it all with no missing information or misinterpretations. We also need an intelligent way of presenting the production data. IPC-2581 is one of the sys- tems that communicates the electronic design into the digital environment of the smart PCB factory with sufficient intelligence  . IPC-2581 is a generic standard for PCB and assembly man- ufacturing description data and transfer meth- odology. Developed in 2004 by IPC, IPC-2581 is used for transmitting information between a PCB designer and a manufacturing or assembly facility. For nearly every step in the industrial process flow, IPC-2581 offers a standard to help companies ensure superior manufacturability, quality, reliability, and consistency in electron - ics assemblies built for their products. Garbage In, Garbage Out With tools like CircuitData and IPC-2581, we can secure correct description data, provide sufficient file intelligence, and enable a full digital data transfer to give value to the smart PCB factory. Without these tools, we retype specifications and accept human errors just like we did decades ago. By using a less intel- ligent transfer methodology than IPC-2581, we accept incomplete information. Garbage in, garbage out! A chain is no stronger than its weakest link. Data for the future smart PCB factory requires the same digital quality for transfer between the designer and the smart PCB factory. 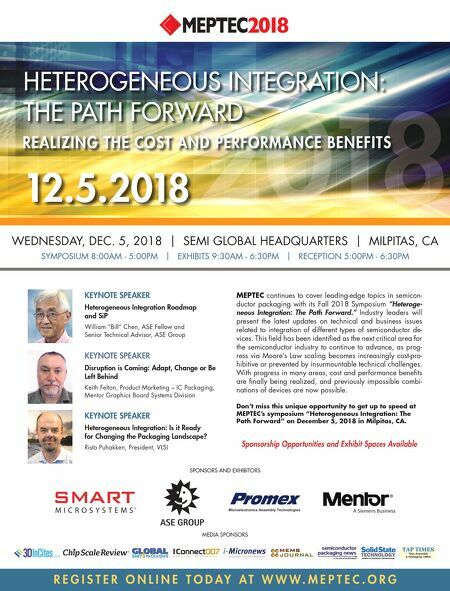 Auto- mated manufacturing requires digital specifica- tions. Nothing less is acceptable. DESIGN007 References 1. Unimicron Germany Rises from the Ashes with New Smart Factory by Pete Starkey (I-Connect007) and Michael Weinhold (EIPC), PCB007 online, April 30, 2018. 2. The evolution of Industry 4.0, through the eyes of the PCB manufacturer by Shavi Spinzi, Evaluation Engineering online, June 22, 2017. 3. circuitdata.org 4. ipc2581.com Jan Pedersen is senior technical advisor at Elmatica. To read past columns or contact Pederson, click here. To avoid ambiguous specifica- tions, we need a common language to communicate the specification and use the same terms in all parts of the transmission chain. Feature Column — Digital Specs for Automated Manufacturing: Find the Missing Link!